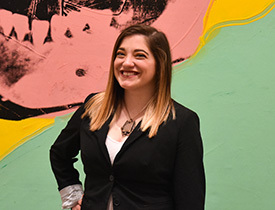 In their roles at The Andy Warhol Museum, alumnae Charlene Bidula and Lena Tavoletti are directly applying the knowledge and skills they gained in the sports, arts and entertainment management classes at Point Park University. 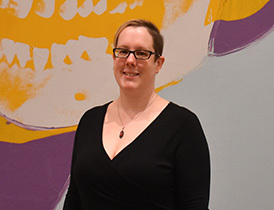 Bidula earned an M.B.A. degree concentrating in SAEM and is now communications manager for the The Warhol. Tavoletti earned a B.S. in sports, arts and entertainment management and is currently pursuing her M.B.A. degree from Point Park University as well. In the profiles below, Bidula and Tavoletti discuss how they landed their positions, the work they do at The Warhol, why they chose Point Park and more. "My nearly eight-year background in marketing and communications for arts organizations, as well as my degrees earned at Point Park University, gave me the skills and experience I needed for this position." "My professors are highly knowledgeable and have presented course work that is both challenging and relevant. Point Park was the right decision for me and I am exceedingly grateful for all of the tools that my degree programs have provided me."